International weapons sales by the United States tripled last year to a record high of $66.3 billion, according to a congressional report that noted big fighter jet and helicopter purchases by Saudi Arabia. The data by the non-partisan Congressional Research Service noted an "extraordinary increase" over 2010, saying the total U.S. figure accounted for almost 78 percent of sales globally. Russia followed the United States at $4.8 billion with France at $4.4 billion, according to the report, "Conventional Arms Transfers to Developing Nations, 2004-2011." China's 2011 sales were at $2.1 billion but focused less on large weapons platforms such as planes and more on smaller weapons, selling them to Asian countries and to African nations, the report said. The data allows members of Congress to see "the level of arms transfers by major weapons suppliers to nations in the developing world ... where most the potential for the outbreak of regional military conflicts currently is greatest and where the greatest proportion of the conventional arms trade is conducted," according to the report. A number of countries in the near-East and Asia, including Saudi Arabia, the United Arab Emirates and Oman, continued or resumed large-scale weapons purchases because of continued threats from Iran. Saudi Arabia was the biggest buyer of arms from the United States, making up about half of the 2011 total at $33.4 billion, according to the report. 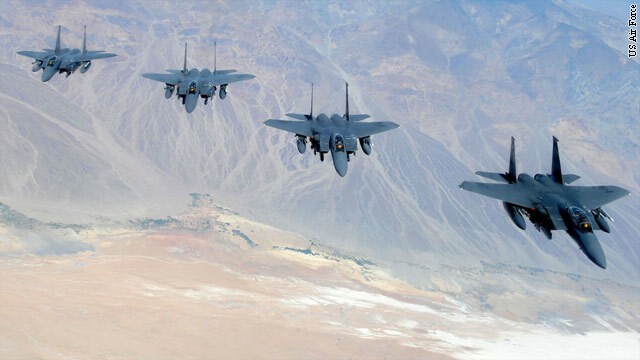 Saudi Arabia bought some 84 new F-15 fighter jets to add to its fleet as well as upgrades for 70 others. The purchase also included ammunition and missiles for the planes. Saudi Arabia also bought numerous Apache attack helicopters and multi-use Blackhawk helicopters. With its very close proximity to Iran, the United Arab Emirates bought an advanced missile shield system called the Theater High Altitude Area Defense (THAAD) and its corresponding radar systems for almost $3.5 billion. The U.A.E. also bought $939 million worth of Chinook transport helicopters. Oman bought 18 F-16 fighter jets for $1.4 billion. "For certain developing nations in these regions, the strength of their individual economies appears to be a key factor in their decisions to proceed with major arms purchases," according to the report. Last year was the eighth-straight year the United States led global arms sales. The United States and Russia made up almost 70 percent of weapons sales in the developing world between 2008-11. While the United States showed huge growth in sales, the international arms market is, "not likely growing at all," according to the report. "There continue to be significant constraints on its (international arms market) growth, due, in particular, to the weakened state of the global economy," the report said. Hi there, You have done an excellent job. I will definitely digg it and in my view suggest to my friends. I am confident they will be benefited from this website. Steve Posted on I really don't know what is more uiettspng that you don't know the answer to this question, or that I do. Check out STIII, my young friend. A 17-ish Spock experiences pon farr on a quick road to manhood, and there is only one woman available on the whole Genesis planet. The cut away from Saavik as she gulps nervously leaves some to the imagination, but not much. Cast your own vote against Robin Curtis, but please remember that Spock (and, director Leonard Nimoy) has cast his. By allowing the pot of war to $immer for 11 years and by not taking any meaningful action against Iran, Pakistan, North Korea, Taliban, etc., etc., to win the war against $tate $ponsors of terrori$m quickly, the climate is maintained for increa$ing arm$ $ales to everyone! No one make$ any money in a $hort regional war. Why are we selling advanced weapons to Saudis? They would use them against israel and against us if they have the chance.It's written in their not so religious book that they must either convert the unbelievers or kill them. Google it up online, it's all in the Quran. Old People = Glob of cells that we don't care about. Let them die. Sick People = Glob of cells that we don't care about. Let them die. Poor People = Glob of cells that we don't care about. Let them die. Female People = Glob of cells that we don't care about. Let them die. Non-white People = Glob of cells that we don't care about. Let them die. Non-christian People = Glob of cells that we don't care about. Let them die. Unemployed People = Glob of cells that we don't care about. Let them die. Gay People = Glob of cells that we don't care about. Let them die. Glob of cells in a womb = Something we PRETEND to care about just to get votes. Gun Control = Something ELSE we PRETEND to care about to get dumb redneck votes. All the talk of defense cuts and war efforts winding down the Machine is getting hungry. Time to feed elsewhere. USA is the biggest merchant of death, but pretends to be holier than thou. This what the Russians need to do. The world leader in exporting death. Nice to see that we're still no.1 at something. You can always leave the country, and go somewhere "peaceful" until the Islamic Fundamentalists come and chop off your head. Awwwwwwww.........did I offend you, "patriot"? There is nothing wrong with being a patriot. Not saying I fear Islam as if it were the devil but everyone uses patriot in a negative connotation today and there is nothing wrong with being patriotic. I dont believe Bob has anything wrong with being a patriot. Please notice the quotation marks. He's implying that the person isn't a true patriot. You know the old saying, "To ensure peace you must be prepared for War"? We have to remember that as the global arms leader, we have quotas to meet. We sell to "friendly" countries in hopes that our troops never have to be on the wrong end of these weapons. We are hoping these weapons will be a deterrent to war, but I don't think they will. Saeed, the problem with ships and carriers are submarines. I would think that all systems (weapons) platforms have a fatal flow or weakness the other side can exploit. The question: Do you have the best toys to do it with? Learn to spell the word 'countries' properly. Learn to use the "Reply" button..
During the Persian Gulf war, those intelligence reports would come out: "Iraq: incredible weapons – incredible weapons." "How do you know that?" "Uh, well … we looked at the receipts." Wow. Honestly, I feel like my intelligence level drops when reading all the racist, misinformed, close-minded garbage that people post on CNN forums... and that doesn't include the terrible grammar and use of the English language either. if your logic and reson is better then you are welcome to try your fire at this battle ground. Another smug, self-righteous, sanctimonious Canadian heard from. damn thats almost funny fighter jets mean nothing in real war all fighter jets have a maximum range og 500 so thats how totally useless they are. whats moore important are heavy battle ships with long range cruise missiles and icbms and aircraft carriers thats what makes the differents. You're obviously ill informed arm-chair Saeed. I imagine the experts in Western and Eastern Militaries, making and or buying these weapons platforms, are far more versed in what battle systems will be effective for their uses against perceived threats. Not you.